If you're into holistic therapies they represent the Chakra's, which was my intention. If you're not into all that, then they're pretty rainbow sun catchers! I dabbled in making jewelry once. I'm mostly into patchwork and quilting, but most crafts appeal to me. Seeing the finished product makes it all worthwhile. They are beautiful. 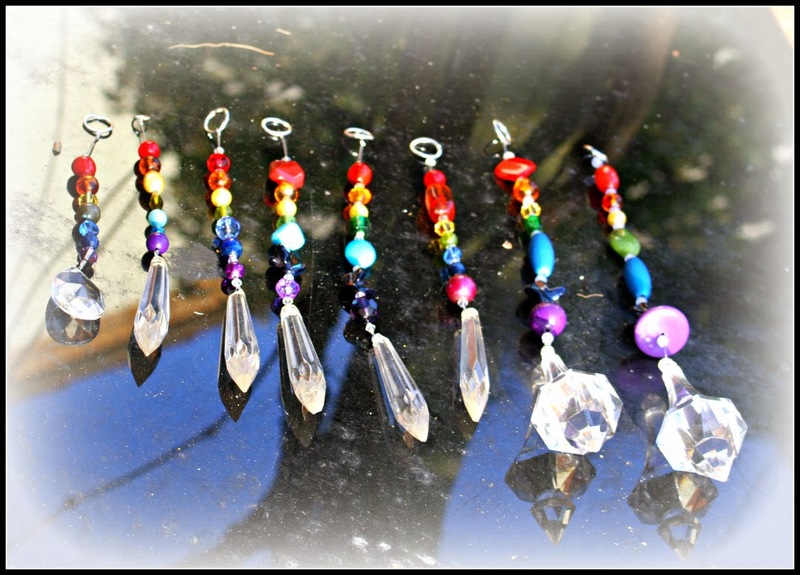 I love making suncatchers out of chandelier crystals too! Those are really cool. I love it when I go into crafting mode. Currently, I"m blogging, while my daughter is in major crafting mode, making a sampler of stitch patterns from one of my crochet books. It's so nice to spend time together like this. I do love your amazing creativity. Those are so pretty. So pretty! My fav are the ones w/the bigger bobber-like crystal at the end. Bigger is better, right, lol!